Nature created in a 500 million year process the imposing and sometimes unreal landscapes of the American Southwest Utah. The perfect natural stage Colorado, Utah, Northern Arizona, and Northern New Mexico all have distinctive four seasons with spectacular fall colors. The Grand Canyon, Arches National Park, Bryce and Zion Canyons and the Painted Desert landscapes of the Southwest United States has long captivated artists, writers and photographers who have sought to arrest its drama in image or word. But all attempts ultimately fail, which you realize as you’re standing on the edge of the 5,000-foot precipice that is the Grand Canyon, searching the depths below for a glimpse of the silver ribbon which is the Colorado River, while a hawk floats in the blue expanse overhead. 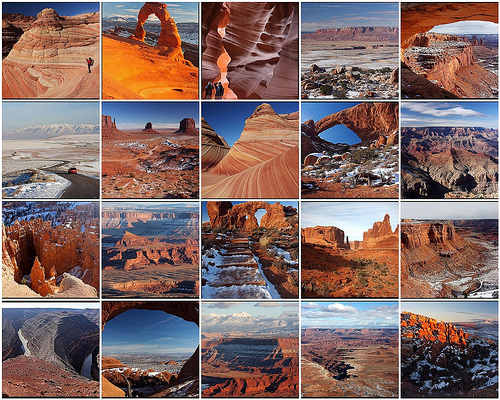 Remarkably diverse but no less moving are the marvels of Arches, and the neighboring Bryce and Zion National Parks.